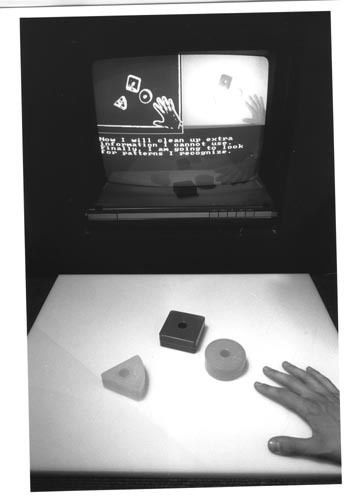 B&W image of a white pad on which there are three different blocks and a human hand. In the background is a computer screen with a split image. On the right is a picture of the pad and it's contents. On the left is a digitized image of the pad and its contents. Printed on the bottom portion of the screen " Now I will clean up extra information I cannot use. Finally, I am going to look for patterns i recognize.|"
Verso in pencil " Vision System Identification Computer"